Biographies of Kim Il Sung usually start with the same phrase; “Kim Il Sung was born in the small village of Mangyongdae in 1912.” Mangyongdae, located in Pyongyang, has long been designated a site of great significance by the North Korean authorities. However, an interview published in 2011 by the Russian journal “Sovershenno sekretno” (lit. “Top Secret”) presents new information that contradicts this seemingly well-established fact. The interviewee was Major General Nikolai G. Lebedev, a former member of the USSR’s 25th Army military council that occupied the northern part of Korea from 1945 to 1948. The original interview was conducted in 1984 by the director of a Soviet-North Korean film commemorating Senior Lieutenant Novichenko, alleged to have thwarted an assassination attempt on Kim Il Sung. The content of the interview was not released until much later. In the summer of 1945, our Army was defeating the Japanese in the north of the Korean Peninsula. I was a member of the military council of the 25th Army, commanded by Colonel General I. Chistyakov. One day I was summoned by the commander and given an encrypted telegram, ordering our Intelligence Service and us, the ideological workers, to find and prepare several Koreans as candidates for the country’s leaders, including the post of General Secretary. The telegram also contained a long list of requirements for consideration; social background, education, political platforms, and even everyday behaviors and bad habits. The task was fulfilled quickly, but none of the candidates made the grade. We did not want to have an argument with Intelligence, and it would be dangerous to put off the implementation of such an important order, so we decided to ignore several points and began to train the (Korean) cadres. Every candidate received training from seven instructors. I was responsible for the most important aspect–Marxism-Leninism. We studied for 10 hours a day without a break. Suddenly, a few days before the war with Japan was over, we received a secret order from Stalin; dismiss our candidates for the position of the General Secretary and urgently start training Kim Il Sung, who then held the rank of Captain in the Soviet Army. I am now aware that the man behind this operation was Lavrentiy Beria. First, in order to be on the safe side, he talked Stalin into ordering the Main Intelligence Directorate (MID) to start looking for a candidate and then gave the order to his own men to search for a Korean residing in the USSR. They complied and found [Kim Il Sung]. Beria never missed an opportunity to reduce the power of the MID, and he did this by subtly attacking its positions and increasing the influence of the secret police. Thus, he reported to Stalin that the MID candidate was not fit to be General Secretary, but that his [Beria’s] candidate Kim Il Sung was the perfect man for the job. In this way, he earned yet more praised from the Generalissimo [Stalin]. Kim Il Sung was soon delivered to us. I thought it odd that he was dressed in a Soviet captain’s uniform and had an Order of the Red Banner on his chest, while the man who brought him was dressed as a civilian. The thickset, round-faced Korean spoke good Russian, but in terms of political qualifications he was utterly ignorant. He failed the Marxism-Leninism exam completely. But we had no choice; we could not just go to Stalin and report that his candidate wasn’t qualified. We had to create a General Secretary from what we were given. Whilst we were teaching him theory, we <…> acquainted Kim with important Koreans in influential governmental and non-governmental organizations. Kim had to understand the importance of his mission and in this he succeeded very quickly and was bursting with pride. “Understood,” Kim obediently replied, then went to sleep. I have to confess that in the moment I was most afraid for myself, but fortunately, the Intelligence representative was downstairs so Stalin never came to know how poorly his colleague was prepared to perform as a Head of State. I personally took the Order from him and Kim never saw it again. ▲ This photo was taken during a demonstration hailing the Red Army on October 14th, 1945. The uniformed Korean standing next to Kim is the Soviet Major Mikhail Khan, the highest-ranking ethnic Korean of the Soviet Army, briefly considered as a candidate by the Soviets to lead Communist Korea. ▲ This is how the same photo is presented in modern North Korea. Flags, Soviet generals and the Order that Kim Il Sung was wearing have been removed. My pupil soon became quite proficient at giving speeches at demonstrations and his popularity rapidly grew. But the American press started to hint more and more often that he was a henchman of the Kremlin rather than a true representative of the people. As time went on, the moment when the future leader would have to meet with foreign correspondents drew ever nearer. We chose a village for this important meeting. This village was to become Kim Il Sung’s birthplace (later to be turned into a grand memorial). The locals “volunteered” (“if you ever speak of this, we will execute you and your family!”) to testify that Kim was indeed born “in this poor house” and when he was a child “he used to run down this path.” Those who confused the path and the house were forced to leave the village, and their homes were occupied by new settlers who were promised a quiet life in exchange for repeating the exact knowledge of the First House and the Most Important Path. Despite the “Chief Director” being in Moscow, the performance was perfect. 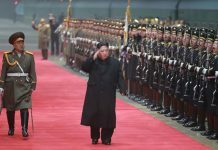 As soon as Kim entered his “home village,” the villagers, crying in happiness, ran to him and immediately organised a feast with flowers, song and dance. 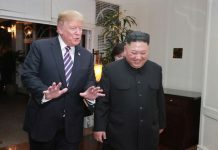 Kim was constantly hugged and praised, and one of his “fellow villagers,” a known criminal, hugged the “beloved Kim” so hard that Kim stopped breathing. The criminal was overplaying it so he was carefully removed from the performance. The foreign correspondents were clicking their cameras without any great enthusiasm, but our photographers spared no videotape. ▲ This photo was taken at Mangyongdae. Kim Il Sung appears at the far right. Major Mikhail Khan is first on the left. Every April from 1967, the DPRK ambassador presented me with a personal invitation from Kim Il Sung to his birthday. When I arrived in Pyongyang a “Mercedes” would be waiting for me right next to the plane and it took me to one of the governmental residences in the suburbs, where I spent about a week in luxury and was denied nothing. I met Kim Il Sung once on each visit. The Leader usually arrived in the evening; we walked together in the park for an hour or so and talked about old times, then had dinner together and parted ways until next year. That happened 12 times. But in the 13th year the ritual was broken. Kim Il Sung suddenly suggested we go to Pyongyang. We took a tour around the city and then alighted before a neat fence with a memorial plate in front and a big tree growing inside the fence. It took me some time to recognize the place. Back in 1945 Kim and I were there and suddenly we heard the sound of a bullet – a stray or an aimed one, we do not know for sure – whistling over our heads. At that time Kim had no bodyguards and we only had our orderly with us, so we had to duck and crawl to shelter behind a tree. There was no more shooting. We lay low for two more minutes, after which we got up and brushed off our uniforms. One of the senior generals listened to the story and advised dropping any reference to the father, mother and the Order, but to distribute the rest to the masses. Well, the advice of a superior officer is no different from an order, and at times of war orders are to be followed. The next month when Kim was giving speeches at meetings and demonstrations, he always included the story, though his actions were presented as more and more vigorous. Thus, the number of snipers increased to twenty, they were shooting first from sub-machine guns and then from machine guns, and not for several minutes, but for an hour. In subsequent versions, Kim was not just lying behind a tree, but he shot back and every bullet from his staunch pistol hit the enemy right between the eyes. No sniper got out alive. Thirty years had passed when we were once again standing next to this legendary tree. We emerged out of the car and stood in silence near the plate commemorating the most picturesque aspect of the heroic story. The grass inside the fence was expertly trimmed, and fresh flowers were lying behind the tree. It was empty and calm outside; the whole district was cordoned off by guards and in the silence I was suddenly overcome with memories. I saw the bodyguards flinch, and all at once they put their hands on their weapons, and the Leader blanched. The next year, there was no call from the Korean embassy. It should be recalled that the interview occurred long after the events took place. General Lebedev did remember some details incorrectly. Most notably, he claimed that Kim Il Sung was not permitted to wear the Order during the October 14th demonstration, while in reality he was. Nevertheless, the most pertinent facts presented in the interview – such as Kim Il Sung being approved by Stalin for the position of North Korea’s leader only a few days before the end of Soviet-Japanese war (i.e. prior to September 2nd, 1945) and that Mangyongdae is not his native village – are very likely to be correct.